Ahhhh I really wish they didn't change the Montre's expression. Does anyone have the original images for these? You can usually get old Subeta stuff off archive.org; just plug in the image url. I gotta say, I really like the Feli! The way the pinker tones of the shading reflect the color of the markings is perfect. Reminds me of old-school video games with limited sprite palettes. The Feli is very cute, but the wings look like they were snapped in like Legos. Very odd. The Montre - I agree about the expression. And why couldn't it have big sweet eyes, like before? The new eyes seem small and flat, especially for a Chibi pet. That Feli is impossibly cute. Gah. 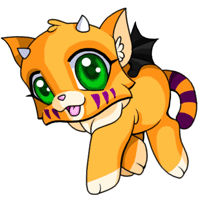 I don't know why I'm such a sucker for chibi pets, but there you go. 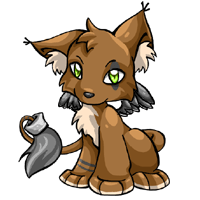 I usually find the Feli's horns pretty silly, but in this case they really make the pet. I like the wings, I like the tail, I like the fat little toes... If I could get pet slots more often than once a year this guy would definitely be on my list. Excellent revamp.